This year we are taking a bit of a review year in our spelling studies. I have two children who are working through All About Spelling Level 1 as a way to review and cement their beginning spelling skills. Since both are new readers I did not want to push them too far, too fast with spelling skills until their reading skills were more solid. For my oldest child, Curly (4th grade), we decided to start back at the beginning with spelling. Spelling is not her favorite subject and she sometimes still struggles with spelling common words. To help her, we decided to take a break from our spelling curriculum (Phonics Road) and try a slightly different approach. We started in All About Spelling 1 and then completed Level 2. We covered a lesson almost every day for Level 1, and it only took a day or two to complete a lesson in Level 2. However, I did find a few concepts that were still a challenge to Curly so the review definitely helped her build a more solid spelling foundation. Once we hit Level 3 our pace only slowed down slightly. We covered a lesson every 2-3 days in most weeks. However, it was in Level 3 where I began to see the true beauty of the All About Spelling program. In this level the concepts start coming together and the child receives a great deal of practice in applying the various concepts learned throughout the program. Level 3 also contains wonderful review of concepts. I wanted to share how we’ve found Level 3 to be different from the previous levels as well as the reasons we are enjoying this level so much. Most lessons begin with a short section of word analysis. A word is spelled with tiles and the child must analyze the word to determine base word, prefix or suffix, spelling rules, number of syllables, and type of syllables. This section is beneficial because it helps Curly remember multiple rules and concepts and apply all of them to one word. It pulls from all of her spelling knowledge and allows her to see how the concepts can be related and work together. By this level, the student has learned the 5 jobs of a silent “e.” Words are given and the student must decide which job the “e” is doing in that particular word. This was an area that has been challenging for Curly. She is often unsure if a word needs a silent “e” at the end and it had become a guessing game. This part of the lesson has helped her critically analyze words to see if an “e” is needed and what job it might be doing. The tiles are used in this level to teach new concepts although most spelling lists are meant to be done on paper (or whiteboard) instead of with the tiles. While the tiles can be cumbersome, I’ve found that they are still very helpful when introducing a new concept. It helps for Curly to be able to move the letters around, divide words into syllables, and choose correct phonogram team tiles. The tactile learning has really helped cement her spelling knowledge. The end of each lesson often has extra words that exemplify the new concept as well as dictation sentences. These sentences contain words from the current lesson as well as words from previous lessons. Curly does not particularly enjoy writing out the dictation sentences but they have proved to be helpful in encouraging her to spell words correctly in context. They are also excellent review of previous concepts. By doing these dictation sentences faithfully, Curly has begun to apply the spelling rules to her writing outside of spelling time. This level begins introducing some common homophones such as “to” and “too.” Definitions of each word are taught and the lessons include dictation sentences so the child can practice using the correct homophone in context. This was a challenge for Curly so I’m glad this level highlights these homophones. She needed the review and extra practice. In these sections, I create a list of letters or letter teams that can all make the same sound. Then Curly has to sort spelling words into the correct column according to which letter or letter team they contain. For example: “o,” “o” with a silent “e” at the end of the word, “oa,” and “ow” are all various ways that the “o” can say it’s long sound (or it’s name). This level focuses on various suffixes – both ones that begin with a vowel and this that begin with a consonant. The rules for adding the various suffixes to words are also taught – one syllable words that end in a vowel and consonant require you to double the final consonant before adding a vowel suffix while a consonant suffix does not require doubling the final consonant. The lessons often have the child write a base word and then add the suffix to make sure the rules are correctly applied. Teaching suffixes in this way took out the guesswork for Curly. Now she knows if a letter needs to be doubled before adding a suffix and she is able to analyze words and determine the base word. In this section there are a list of words included. The words are to be dictated to the child and he or she should make up an original sentence containing that word and then write the sentence. I have found that Curly often spells words correctly during a spelling lesson but often misspells words when she is writing in another subject. She has a difficult time remembering to spell words correctly in context. This section of the lessons has been hugely helpful in giving Curly opportunities to spell words in the context of her writing. Overall, I’m so thankful that we took time to review spelling skills this year. 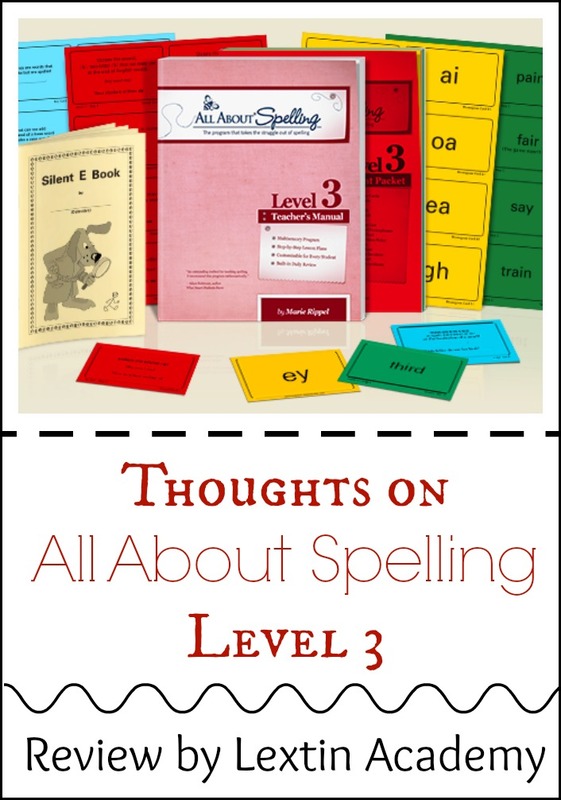 I’m even hoping to begin Level 4 of All About Spelling soon and I’m excited to see what new concepts are introduced in that level. To find out more about our favorite spelling curriculum, you can click on the banner below. I stumbled upon your site because I am trying to help remediate my son who is struggling with spelling and came across your review of the Phonics Road to Spelling and Reading. I was wondering if the suite of resources would be a good place to start and move from as it later introduces Latin – further expanding comprehension and vocabulary. I was hoping to find someone who have blogged about their experience with the program from start to finish and hoped you would be that source. However, it looks like you’ve stopped using the Phonics Road. Might I ask why? Do you think staying on “the road” might have helped Curly avoid the struggles being faced now? I’m simply curious as, again, my son is also challenged. Thanks in advance for any insight you might be able to provide. I have used Phonics Road up through Level 3. I really like the program; however, I find it very time intensive to teach. With 6 children, I couldn’t keep up with watching the videos and teaching the lessons to more than 1 child (in different levels). I also prefer to have my grammar and spelling separate as my kids seem to be able to move at a faster pace with grammar than with spelling. I stopped using the program because of time and because I felt overwhelmed. Do I think it’s a great program? Absolutely! I love how it teaches phonics and think it is very thorough. If I didn’t have several younger ones, I would have probably continued. But I just couldn’t keep up with watching the videos and teaching the lessons. We were completing about half of a level each year and I needed something with less teacher prep work. We switched to All About Spelling and All About Reading (which still teaches phonics using the same method) and that has worked well. We are doing lots of review and practice. I do believe that the foundation that *I* personally learned through teaching Phonics Road has really helped me become a better teacher. Because we went through Level 3 with Curly, I don’t feel that continuing with Phonics Road would have made a significant improvement in her spelling skills as opposed to switching to another program. No matter what we use, she seems to be a little slower to catch on to spelling rules. I think my biggest struggle with Phonics Road (aside from the time commitment) was that at times it felt like busy work. The lessons had so much writing, dictionary work, reading, and literature study that it felt like overkill. In addition, my kids complained hugely whenever we did lessons. And while I don’t switch curriculum just because my child complains once or twice, I was willing to switch this time because we were all feeling a little bogged down and discouraged. I do think the program works and is very detailed and thorough. So I do still recommend it. We’ve just found it simpler to use All About Spelling. I would encourage you to find an Orton Gillingham based program if your child is struggling though. I think that type of program is the very best for teaching spelling and reading if you have a struggling reader or speller (I have one of each…). I hope that’s helpful! Thank you for detailing about level 3. We are just starting level 2, and thinking ahead to next year I was actually going to look for/make resources for her to learn about some of those things (like prefixes and suffixes, and word analysis), not realizing AAS already included them. Yay! Yes! They have great lessons about prefixes and suffixes. My kids found them really helpful!